Everyone wants more traffic on their railroad and we like to have reasons to put them there. I found through research on the period I was modeling, an abundance of new traffic I had never given proper thought to. My revolution came while researching a possible future layout based on my home town of Tecumseh MI. I had picked up one of the local history books and flipped to the industry section. 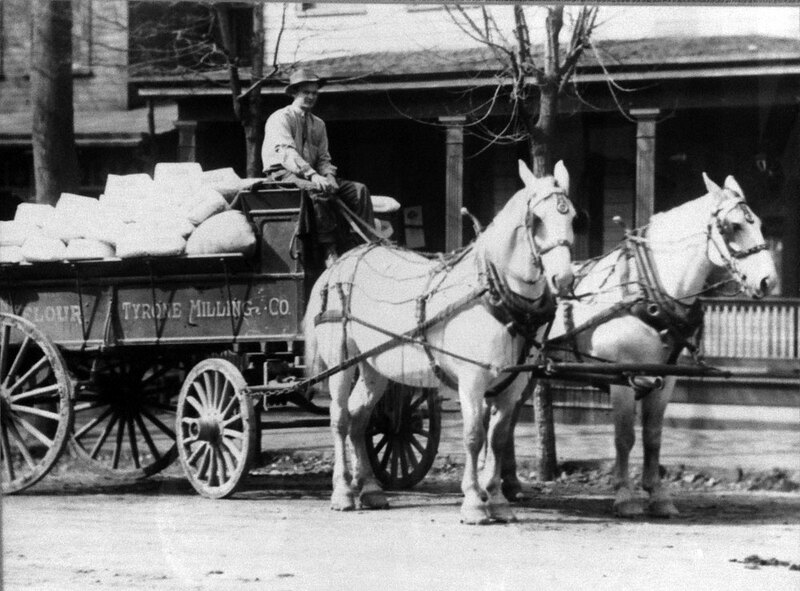 I was focusing on track side industries and not much else when I saw an image of a horse drawn wagon and the caption which said “daily load of flour for the railroad freight house”. This freight house from Brooklyn, MI is very similar to the one that was in Tecumseh, MI. I was struck by the size of the load and that it was daily. I had always know Tecumseh had a freight house but I had only assumed a car every other day for the freight house in a small town. This new off-line industry could increase the traffic to daily. I had never payed much attention to the freight house since in modern times most have been torn down and it has not been a focus for a long time. 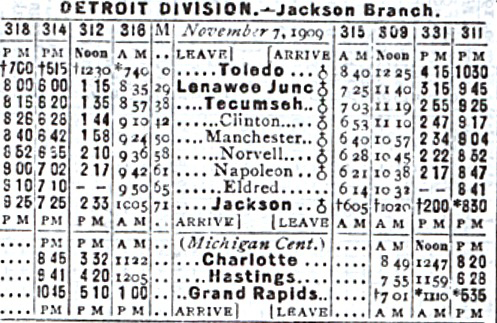 The schedule from 1909 shows that eight passenger trains a day passed Tecumseh. Although located on a branch line the line saw a lot of traffic. This new found source of traffic led me to read more captions for other off-rail traffic sources. As I read and looked further I noticed captions like “supplied to eastern markets” or “known for their XYZ”. Tecumseh was a very small town, if it was “known” for a product, it was not just in this small town. Another clue was the quantity of product a firm built. The small community and surrounding area could not support an operation that output thousands of products. So how much traffic did all these off-line sources produce? Since these industries are off-line, they must be using a station, freight house or team track for transfer to the railroad. LS&MS Passenger Station located near the freight house. To handle all this LCL cargo, the railroads setup freight houses in nearly every town. The freight house acted as the business shipping center for the Community. 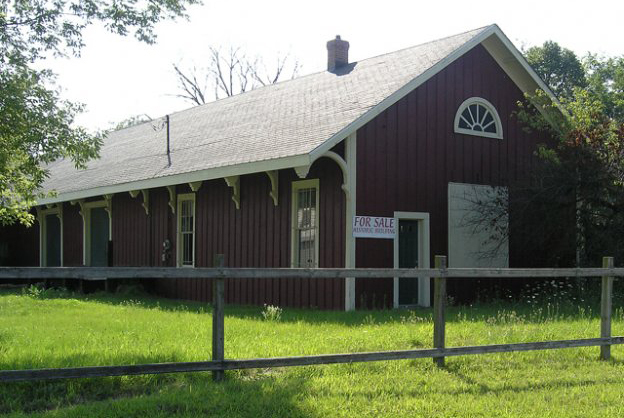 Any business that did not have its own rail siding could bring their goods to the freight house for shipping. This could be for a custom order or regular shipments to a larger market in a major city. This information led me to take a closer look at the railroad and track arrangements in Tecumseh. This gave clues as to the volume of traffic that could be handled. Tecumseh was served by three railways at one time. By the early 1900’s (the time I am researching) only two remained, Detroit, Toledo & Ironton (DT&I) and Lake Shore & Michigan Southern (LS&MS). 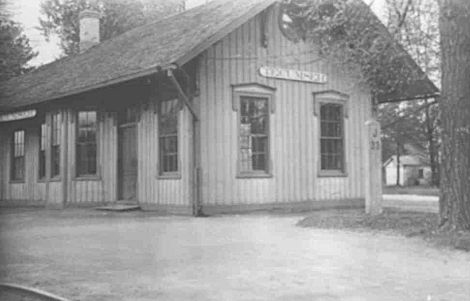 Each railroad had a passenger station and freight house. I decided to concentrate on the LS&MS as it was the larger railroad of the two. The freight house along with a stock yard, grain cleaner and grain warehouse occupied an area in the north end of town. 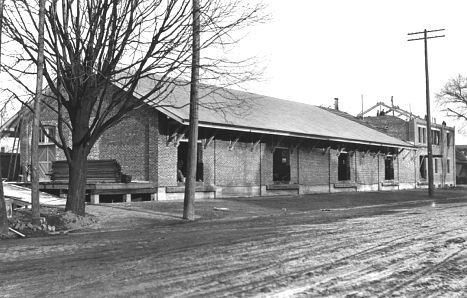 The passenger station was across the tracks on the east side. According to Sanborn maps of the period, the single track line split into three tracks just south of the stock yard. The west track served both the freight house and the stock yard. The eastern most track served the railroad stations. Two additional spurs served a Lumber Yard on the East side and coal dealer on the West side behind the stock yards. The tracks continued to the north to form a small yard and switching area. 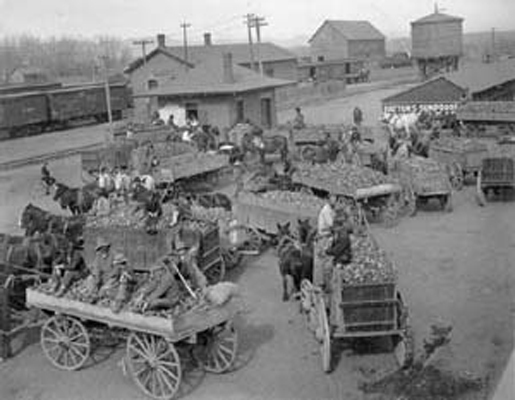 The freight house area in Tecumseh may have looked like this busy western town during harvest season. 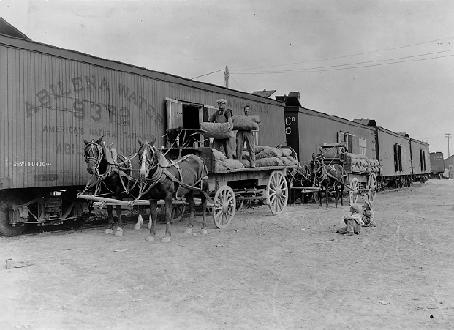 Freight houses could also have a team track area for loading bulk items directly from a wagon or truck. Large loads, such as tractors, could be on/off loaded. Several times I have come across images of families unloading what looks like all there furniture which could only mean they were in the middle if a long distance move. Team tracks allowed for direct loading of cars from wagons and trucks. Although the Sanborn map of Tecumseh does not show any sign of a team track, there most certainly was room for one. The strange angle of Bidwell street and the large area of open space in that area could have served as a team track. From the photos in the book, there was a raised platform from the freight house to the edge of the stock pen. 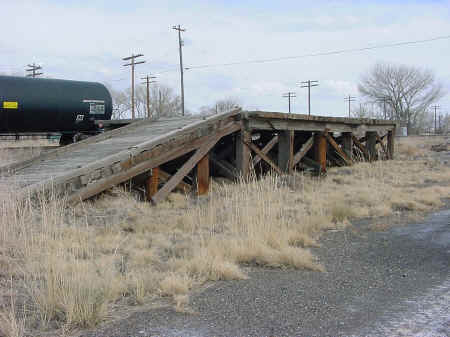 Many team tracks had ramps such as this one for easy loading of equipment onto flat cars. The LS&MS yard and freight house area would allow for several cars and lots of activity for a small community. It can easily be seen that several cars could be spotted without tying up the main track. The freight house and surrounding facilities could generate a decent amount of traffic. 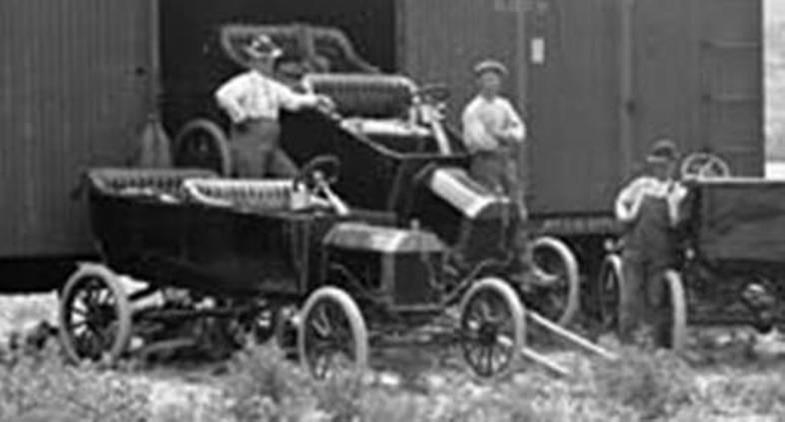 The coming of cars and trucks forever changed the way railroads serviced the community. But let’s not forget how they got there! With the number of off-line industries I have been able to document in Tecumseh, and the farming from the area, the freight house will be a major traffic source. Traffic will be coming and going daily with peak seasons for harvest. I am now estimating a slow day at two cars and a busy day with as many as six or more cars.